Just got this on email. I reckon this is a good gauge to identify the amount of stress you have built up over time in work or studies. A little background on the test, the picture below was devised as part of a stress test developed by researchers at St. Mary's Hospital in London. It is the final picture of a series of stress determinators to gauge the amount of stress a patient has built up over a short time. 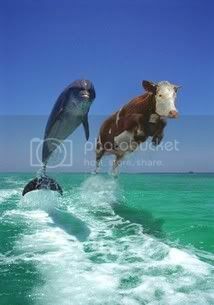 Look at the picture below of two dolphins jumping out of the water in tandem. The research has shown that the more differences you notice in the two dolphins, the more stressed you are. This is attributed to the concentration and recognition influences intensifying when stressed. The two are very similar, so if you can tell the difference without looking hard, you should pack up work and go home immediately. Eh what's this? April's Fool coming early is itttttt? haha.. i think you're stress also..
Test: Office Stress Eh what's this? April's Fool coming early is itttttt? haha.. i think you're stress also..